A few blocks away from the bacchanalian revelry in the French Quarter lies the mysterious and magnificent world of a mainstay of New Orleans Fat Tuesday celebrations. Mardi Gras Indians, resplendent in their brilliantly colored costumes, take to the streets in ceremonial dance to the beat of tambourines and drums, spellbinding confrontational rituals, call-and-response style chants, and Indian second line rhythms. You'll hear rhythms straight from Africa and witness a culture that has changed little for 250 years, providing a snapshot of an aspect of New Orleans that is intimately tied to the experiences of the original slave inhabitants of Louisiana, the first port of call for slaves from Africa and the Caribbean. It's a living theater of art and culture, with each tribe's style and dress on display in a friendly but competitive manner as they compare one another's craftsmanship. Tribe members work all year creating exquisite handcrafted masterpieces with intricate beading and elaborate headdresses or "crowns" inspired by the Plains Indians of the 19th century. These costumes are donned for one season, then disassembled or retired. It's a friendly competition, intensely communal and familial, and a folk art expression unlike any other in the country. Using tribal names like the Wild Magnolias and the Golden Eagles, the earliest tribes such as the Creole Wild West formed during the late 1800s when racial tension was high and black neighborhoods felt unwelcome at mainstream celebrations. Most agree that they patterned themselves after Native Americans to acknowledge their assistance in escaping the tyranny of slavery, since it was often local Indians who accepted escaped slaves into their society. This motif also recognizes the mixed blood of Africans and Indians. Regardless of its origins, the tradition still thrives today. Drums start the beat, chants of "Iko Iko" are heard, and the Big Chief takes to the street with his tribe. Unlike the elaborate parades with floats, the Mardi Gras Indians march mostly within their neighborhoods, engaging in an elaborate showdown, strutting and swaggering like peacocks with other tribes from surrounding neighborhoods. Finally, one chief acknowledges or "bows down" to the other as the "prettiest." In this way, they honor their heritage and that of the Native Americans who once gave them a safe haven. In the past, Fat Tuesday was a violent day for many Mardi Gras Indians. It was a day used to settle scores, but thankfully violence is a relic of the past. Now, tribes simply compete among themselves to produce the most colorful song, dance, and dress. Traditionally, tribes converge throughout the day, in their neighborhoods, on the corner of North Claiborne and Orleans Avenue, and across Rampart Street from the French Quarter at the Backstreet Cultural Museum, 1116 St. Claude Avenue. Here, Indian history comes alive and former chiefs' costumes are displayed Tuesday through Saturday, 10am to 5pm, admission $8. Mardi Gras Indians have had a huge impact on New Orleans music, especially funk and rhythm and blues. If you're lucky, you'll meet 71-year-old Big Chief "Monk" Boudreaux, the most important living link to this tradition. 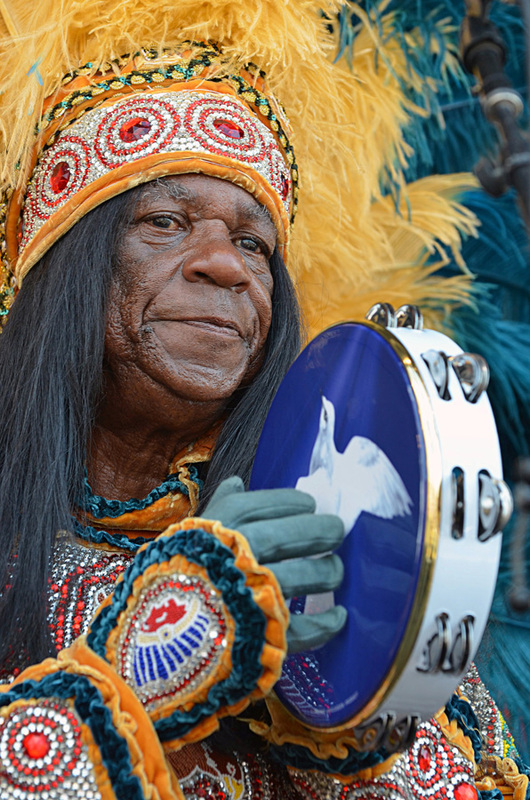 As Big Chief of the Golden Eagles, he's widely known for his long-time collaboration with the Wild Magnolias led by his childhood friend, Big Chief Bo Dollis. In 1970, Boudreaux appeared with the Wild Magnolias at the first New Orleans Jazz Festival. He has since performed and recorded with Anders Osborne, Papa Mali, and Galactic in addition to the Golden Eagles. Music has also become a vehicle for raising awareness of the plight of coastal erosion, a factor that contributed to the devastation caused by Hurricane Katrina and its aftermath. Boudreaux joined forces with blues guitarist and singer/songwriter Tab Benoit and an all-star band of musicians including Cyril Neville and Dr. John in "Voice of the Wetlands," recording and performing songs aimed at raising awareness of coastal erosion that threatens the viability of the region. His contribution to the culture and music place him at the top of the list of New Orleans' most important musical icons and an enduring leader of that culture. In 2010, he appeared in the documentary Bury the Hatchet, an intimate look at the Mardi Gras Indian tradition, which won best Louisiana feature at the New Orleans Film Festival. "When I started building up my own Indian suit, I was 12 years old. It's a feeling you can't explain, because it's something deep inside of you. My grandmother was on her dying bed when she told me we were Choctaw Indians. I was 27 or 28 years old at that time. Then I knew why I was doing it." As he became involved with the Indians, one of his mentors taught him many songs, anticipating that he would one day be a Big Chief. Soon, Boudreaux realized that he had a creative gift. "I started off singing Indian songs," he said. "Later on I realized that I could sing just about anything that I wanted to. I could create my own music, and lyrics just come to me." His musical influences are diverse. "It's like a gumbo," said Boudreaux. "There's a little bit of everything in it."